Save an extra CDN$ 16.01 (49%). Buy the Kindle Edition instead. Sold by Royal Canadian and Fulfilled by Amazon. Sold by Royal Canadian and ships from Amazon Fulfillment. 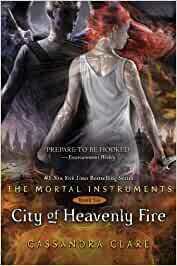 Start reading City of Heavenly Fire (The Mortal Instruments Book 6) on your Kindle in under a minute. I was most interested in Simon’s story and would read the follow-up tales with him, but am ambivalent about reading about the rest of the Shadowhunter crew again. 3.0 out of 5 starsUgh. 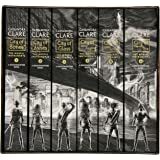 DO NOT READ THIS BOOK IF YOU HAVEN'T READ THE INFERNAL DEVICES TRILOGY!!! THIS BOOK IS FILLED WITH SPOILERS! This was the worst part for me. Every time an old character would appear, it turned me off reading this book because I knew a whole new spoiler would appear! Cassandra Clare really believe that teenagers are stupid for planting so clear "clues" about her other series. Ugh! I liked the Blacktorns and Emma Carstairs, though. And the not-so-subtle clues for her new trilogy were okay for me. I really liked the new characters and I enjoyed seeing different points of view throughout the novel. That being said, I will not pick up The Dark Artifices. 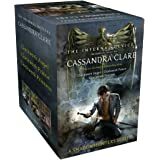 I think I had it with Cassandra Clare. I will finish The Infernal Devices because I started (and because it's my favorite of hers), but that's it. You lost me. I liked the book, the jacket is beautiful even though I couldn't find everyone. Moving into the story, the plot was action-packed. I am really really REALLY disappointed by her attempt to bring Emma (for her future series) into the story. I did not bought it and I will be honest; I skipped most of their story telling (I loved Mark and Emma). I also found some plot holes that were annoying and left me wanting more. I'm pleased by the ending though, I'm glad Simon stayed Simon, as he is one of my favourite. It's pleasing for shipping Malec/Clace as well. I don't know if I'm the only one, but I never liked Jocelyn at all, so her story wasn't interesting to me. And I still loathe the Clave. Yes it did! A great read. Plus I got to use my knowledge of old English beginning in each chapter and sometimes in between. One of the books that I did not want to put down! Al that you expect from the writer. The book sleeve is beautiful and very crisp. The delivery was also extremely fast. The only think I did not like is the fact that there is a sharpy mark on the bottom of the book. I only docked one star as I don't mind it that much. When displayed on my bookshelf, you can't even see the mark. 5.0 out of 5 starsJust get it !